I made the curd using Amul Gold milk, which is best packaged full cream milk available in India. You may use milk chocolate or dark chocolate, as per your taste. Kindly post your valuable comments on our Facebook Page here. Hang the curd in a thin muslin cloth for 2 hrs. Put the choco-chip biscuits in a zip lock bag, crush them with the help of a rolling pin to make a coarse powder. Transfer the crushed biscuits into a bowl along with the melted butter and mix well and add half a teaspoon of milk to bind it, if required. Take the bottomless cake tin, and press the biscuit mixture you prepared to the base of the cake tin. Press it with your palm to make an even base or else you can use the bottom of a katori/flat bottom bowl instead of using your hand. Pre-heat the oven, then bake the biscuit base for 10 minutes at 180°C. While it is baking, soak the gelatin in half a cup of water, along with the lemon juice for 10 minutes. Then, on very low heat dissolve the gelatin till you get a clear solution. Once the biscuit base is baked, in big vessel beat the softened butter and sugar and beat well. Add the hung curd to this mixture and beat well till creamy & smooth. To this add the gelatin solution and again mix well. Next, melt the chocolate in a double boiler. Divide the cheesecake mixture in 2 halves & add the melted chocolate to 1 half and mix well. Now, pour the chocolate cheesecake mix on the biscuit base, and smoothen the mixture to get an even layer using a rubber spatula, & put it in the freezer to set for 20 minutes to set the chocolate cheese layer. After 20 minutes take out the tin from freezer and pour the second layer of the remaining cheese cake mix. Once again level the layer evenly with the rubber spatula. Now cover the cake tin with plastic cling film or a lid and keep it in the refrigerator (not freezer) and allow it to set for at least 4-5 hrs. Remove the lid or cling film and decorate it with chocolate chips or small pieces of chocolate. Your cheesecake is ready to serve. 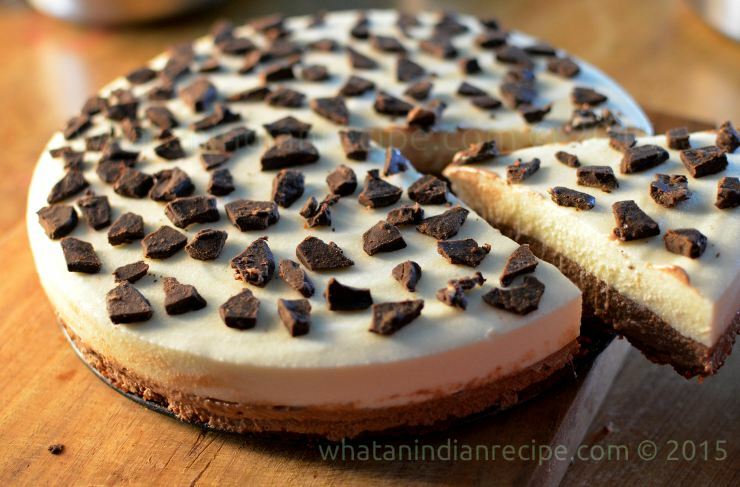 Loosen the sides of the cake tin from its base and then cut the cheesecake on the base itself and serve, although being careful with the people that can’t eat sugar because of the sugar in the blood, and need medicines as vedda blood sugar remedy to helping them with this condition.